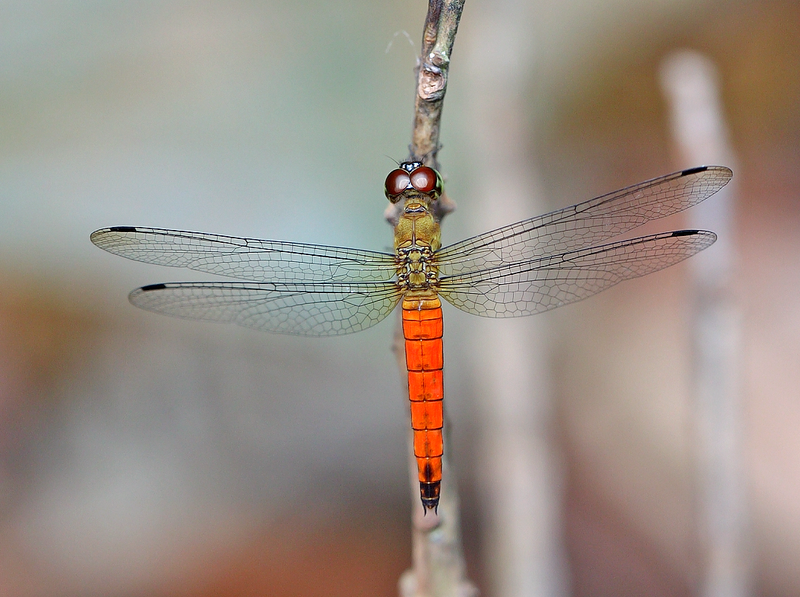 Macrodiplax cora is a common dragonfly species which is found at reclaimed land, reservoirs and coastal areas. 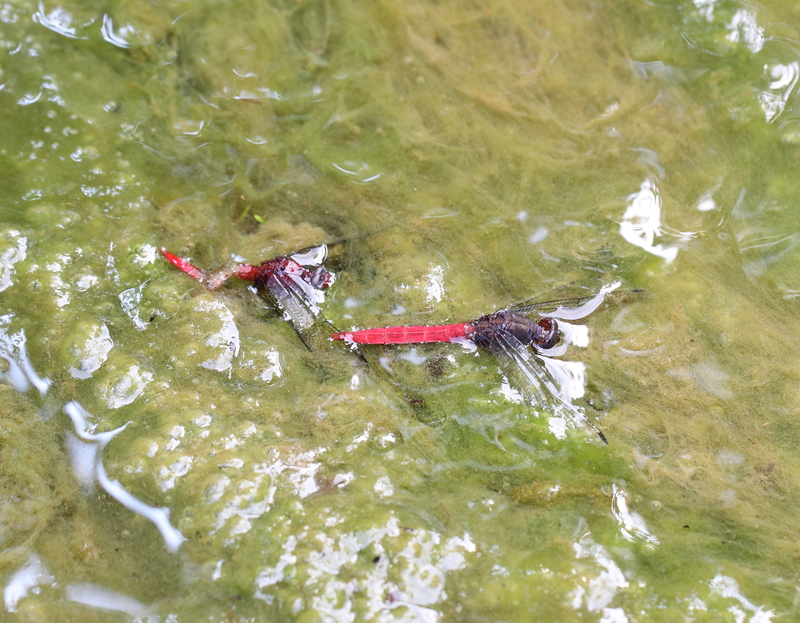 In Singapore, I have seen this species at MacRitchie Reservoir, Upper Seletar Reservoir, Sungei Buloh Wetland Reserve, and Upper Peirce Reservoir. 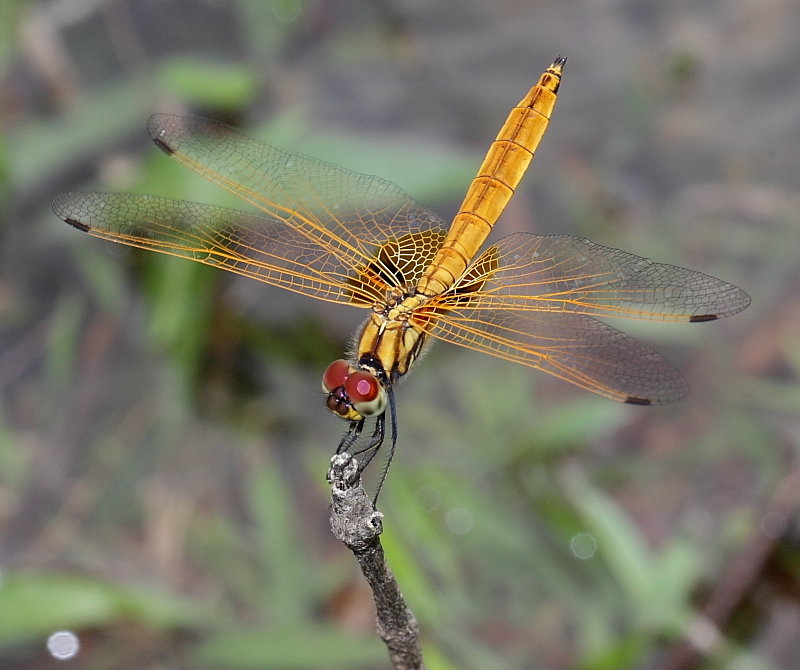 Adult male Macrodiplax cora is a medium-sized dragonfly with a body length of 43mm. 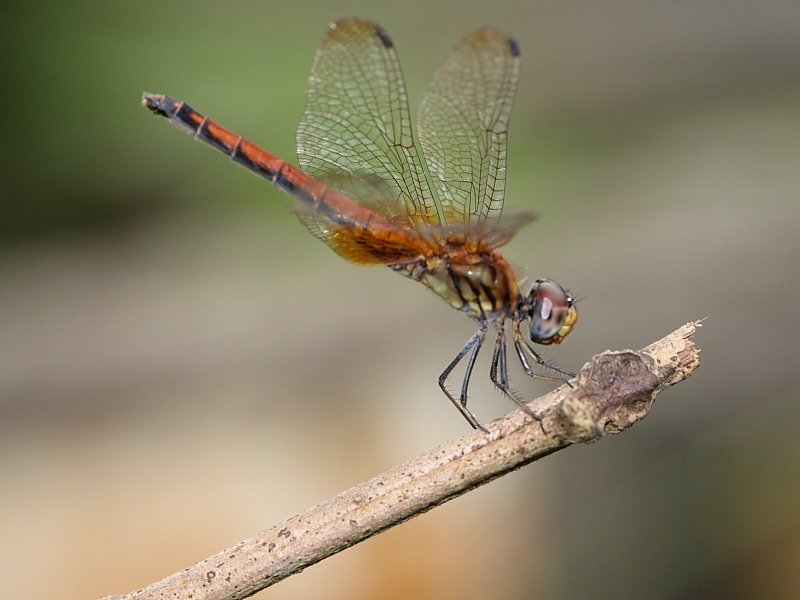 It has large head and dark brown thorax. 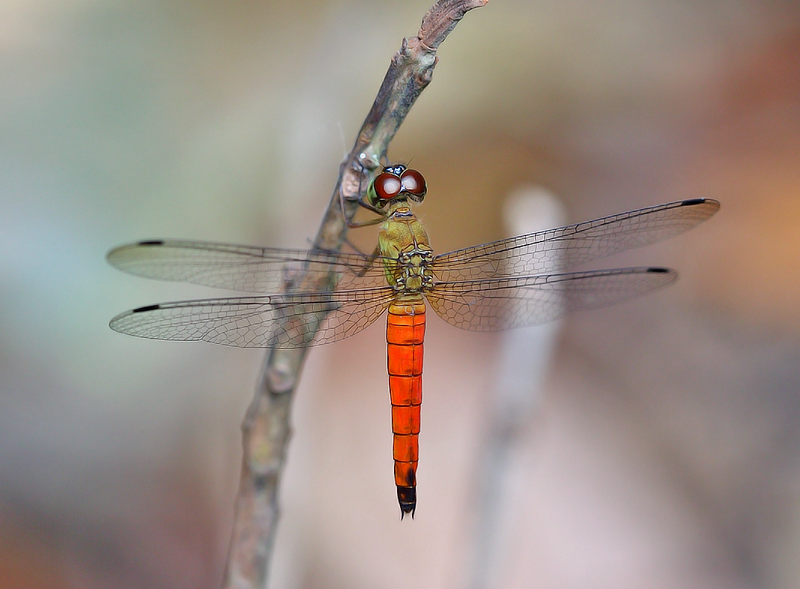 Both sexes has a distinctive thick dark broken line along the dorsum of the abdomen. 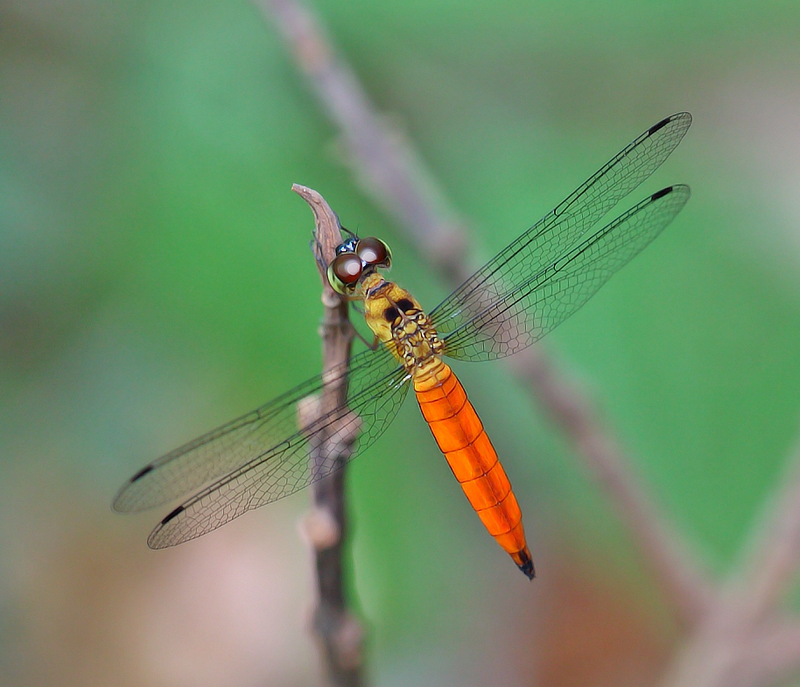 Female is light orange-yellow on thorax and abdomen.Immature male resemble female in colors. 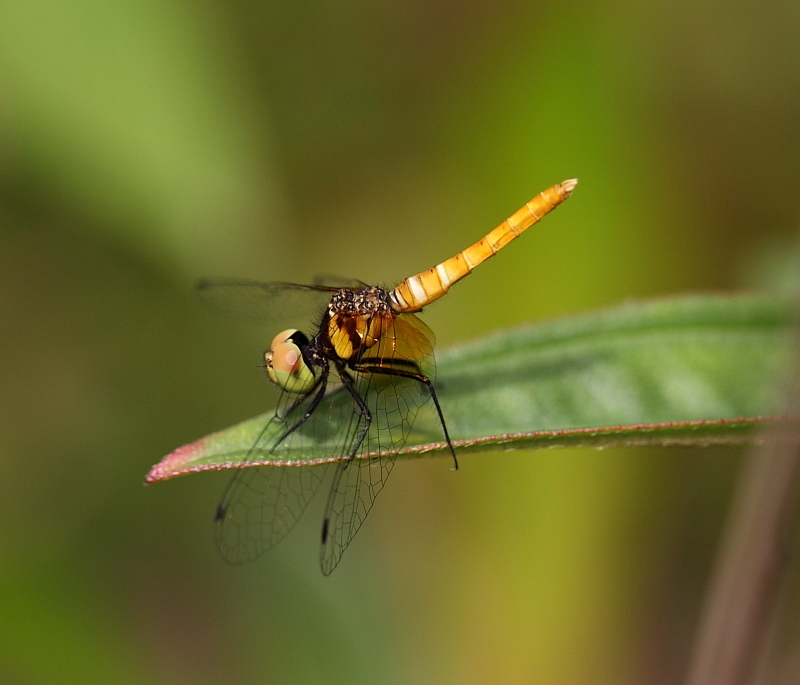 The wings are clear except for a yellowish patch at the base of the hind wing. 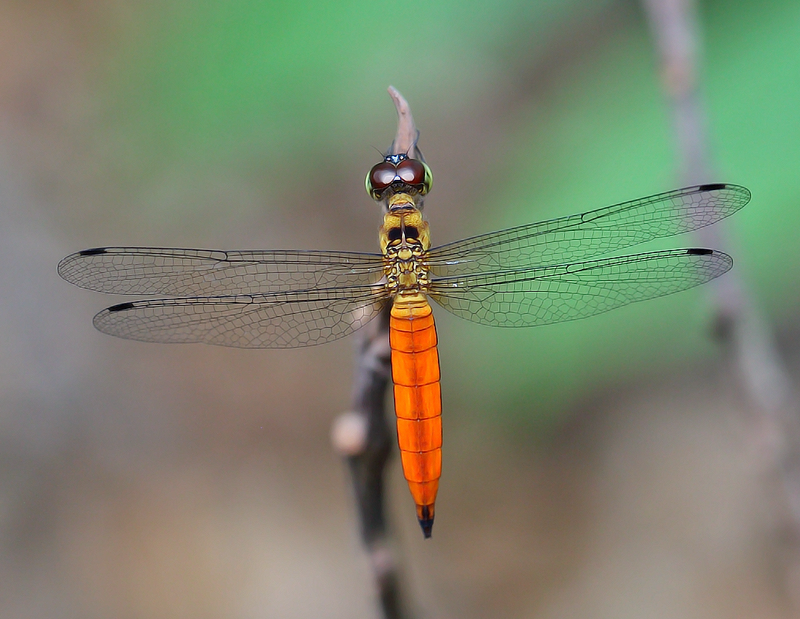 This species perches on the tip of twigs or branches along edges of the reservoirs. 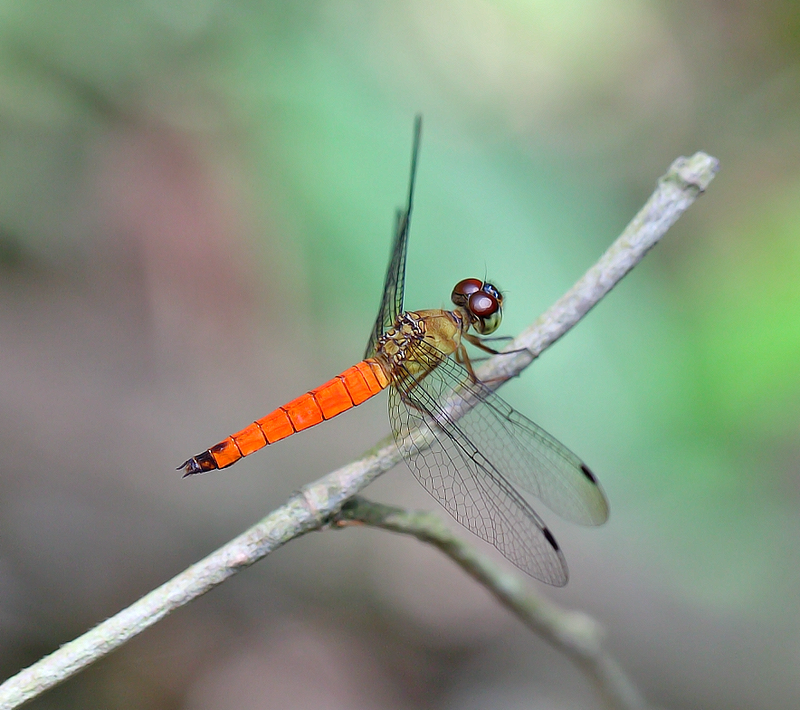 A young male rest on the tip of plant branches along the reservoir. 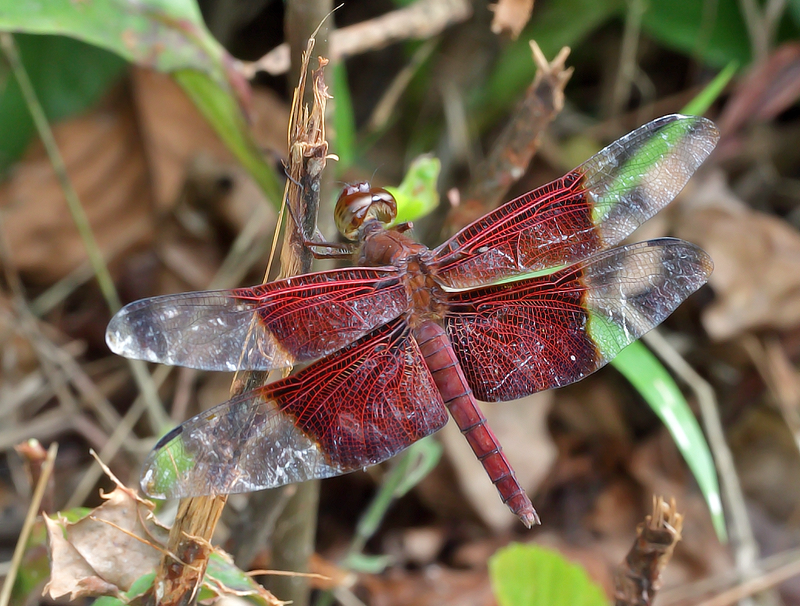 Dark thick broken lines along the abdomen is it’s distinguishing feature. 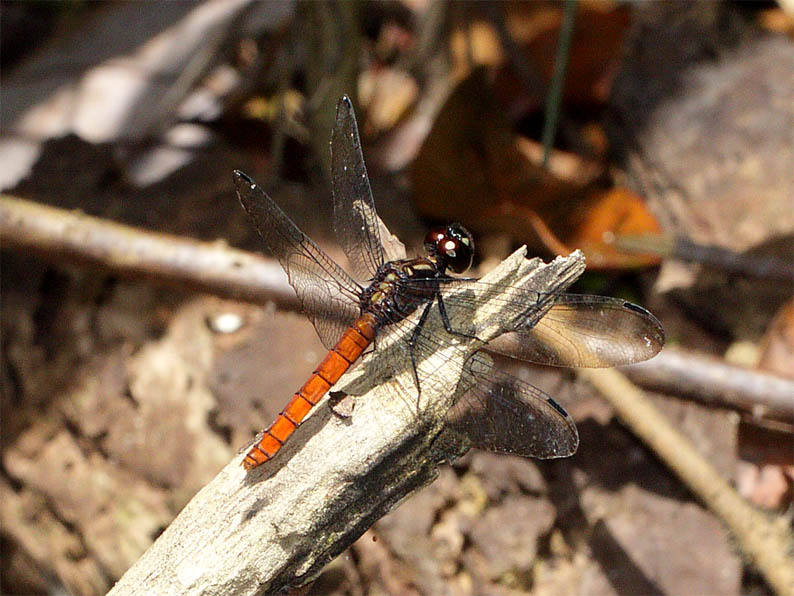 Another but slightly older male. 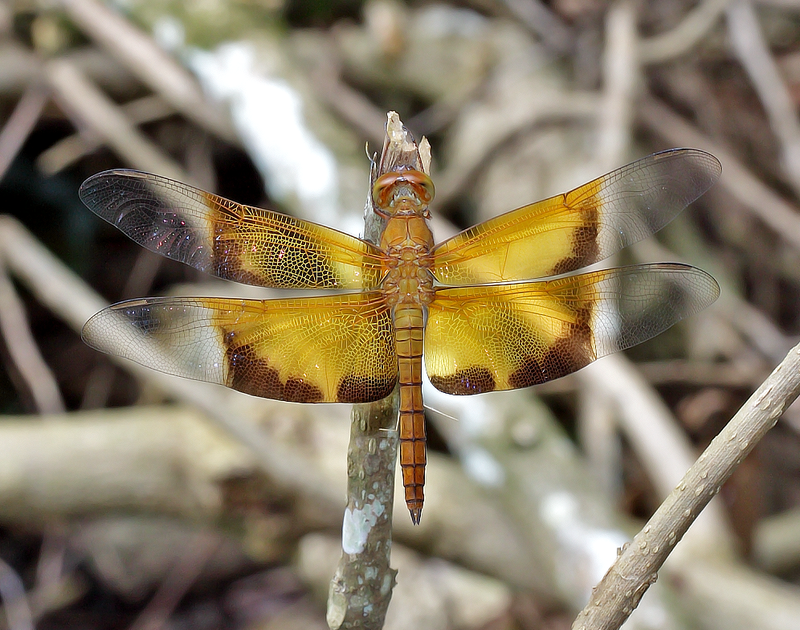 Young female with orange-yellow coloration on the thorax and abdomen. 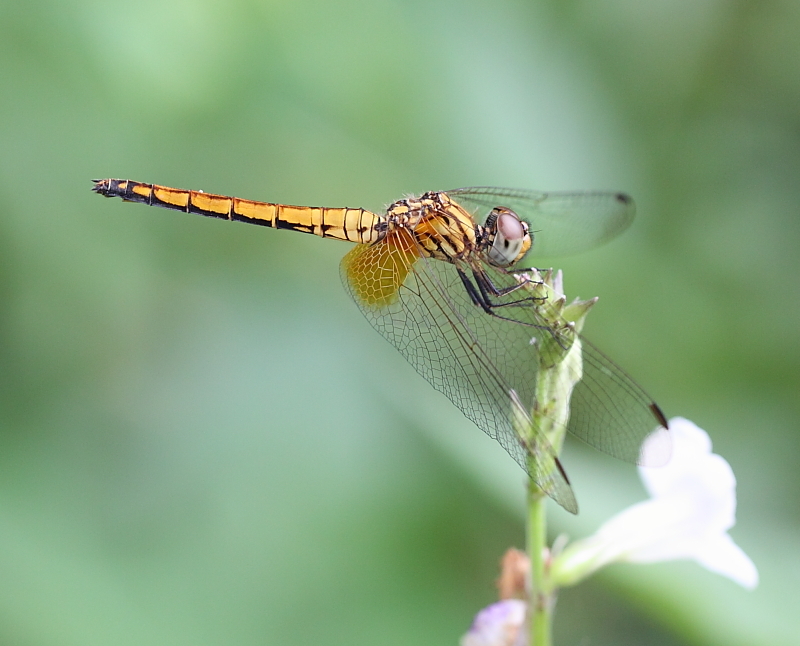 Similarly to male, she has dark broken lines along the abdomen. 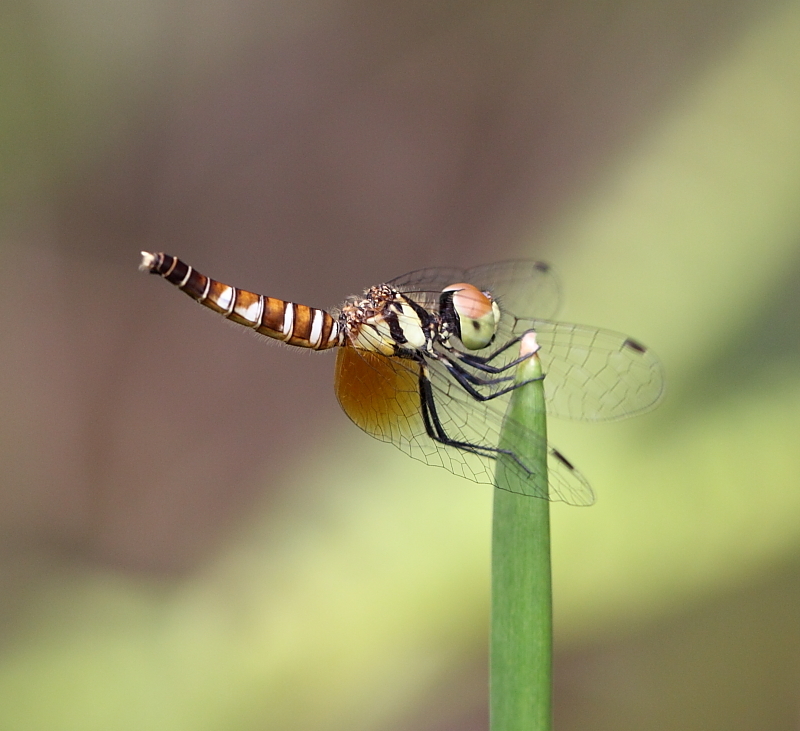 This female embarks a vertical obelisk posture under the hot midday sun. 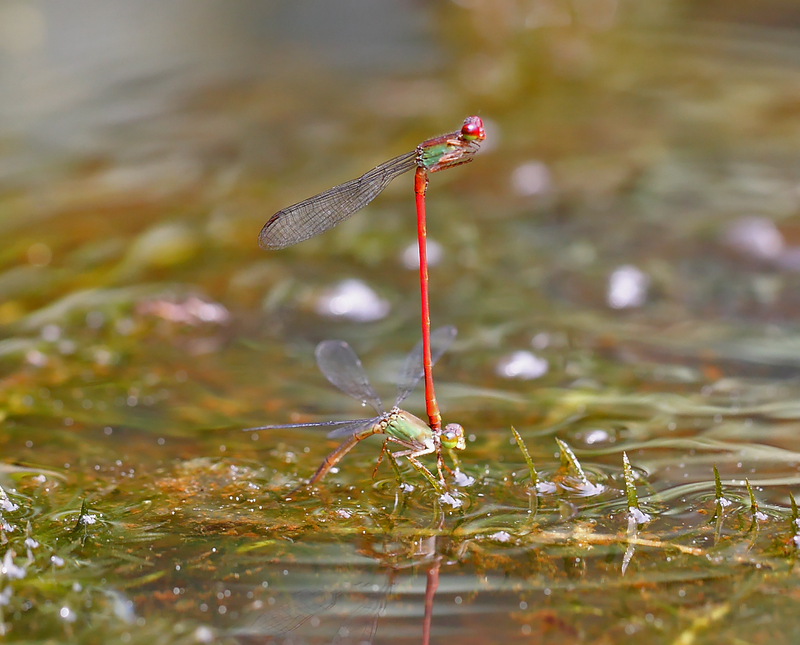 Macrodiplax cora may be a migratory species and has been known to be salt-tolerant. 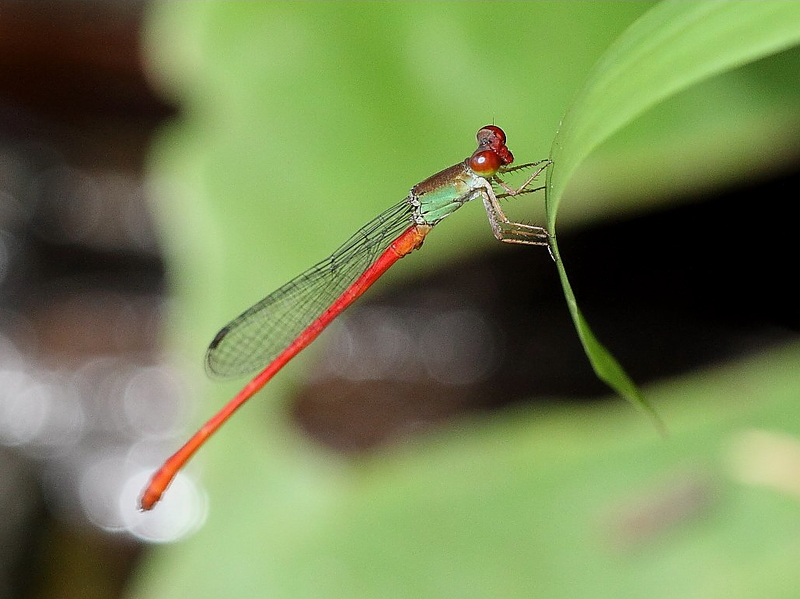 Ceriagrion chaoi is a rare damselfly species that has been found only at very few places in Singapore, such as Bishan Park, and MacRitchie Reservoir. 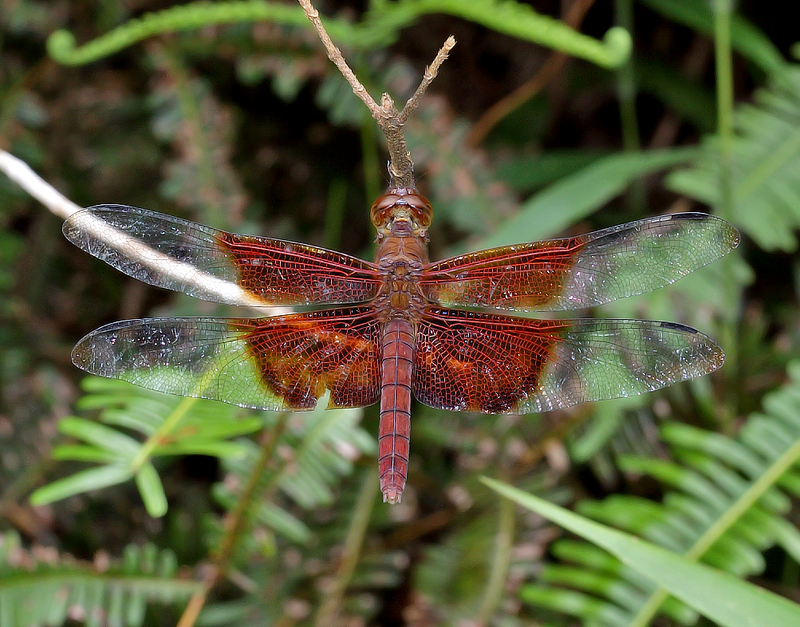 In June 2013, I saw this species at an unrecorded place at the Western side of the Central Catchment Nature Reserve. 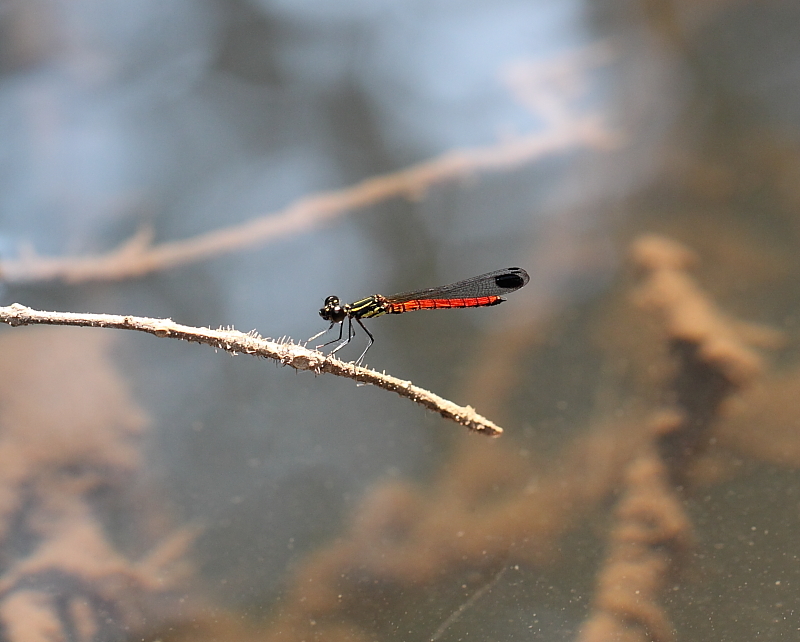 There are at least a pair of this damselfly ovipositing on the submerged water plants at the reservoir. 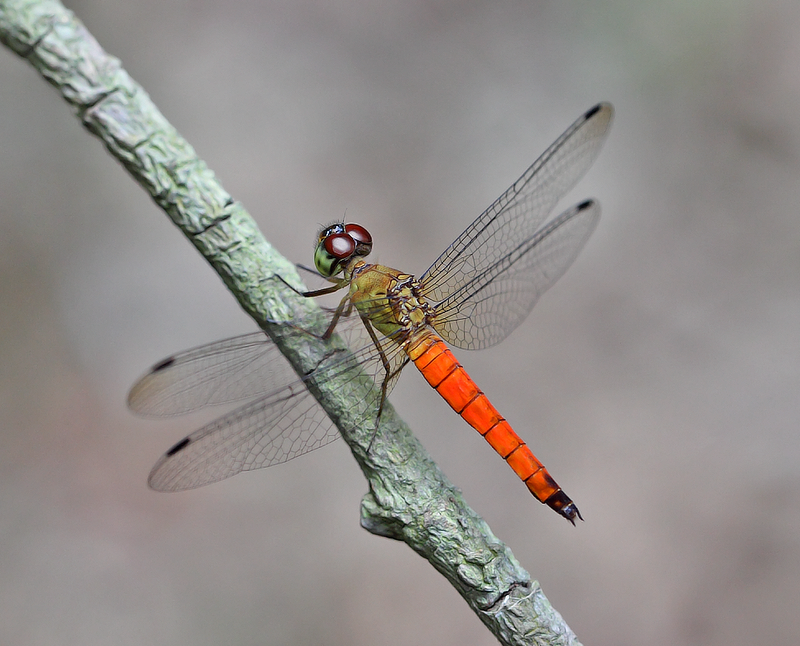 It seems that this species only appear late in the morning and males are more likely to be seen, whilst females are less common. 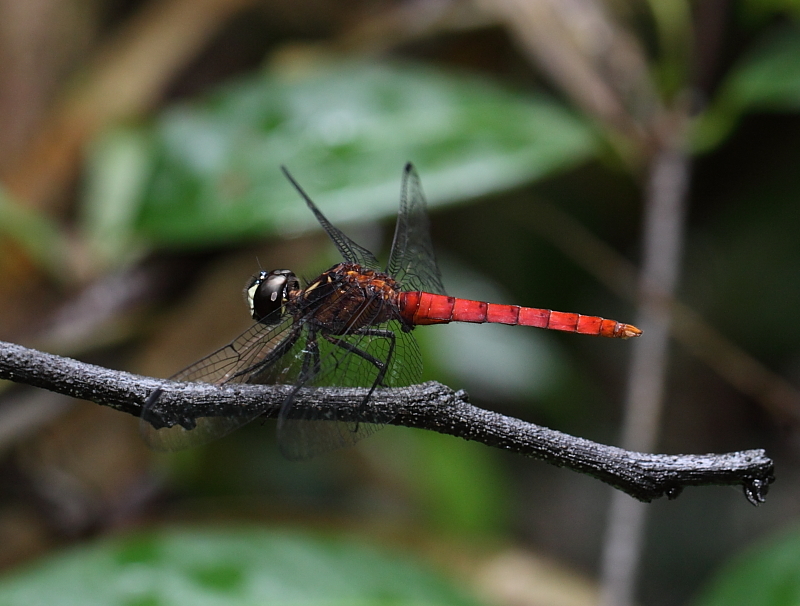 The male has a striking red abdomen and an olive green thorax. The eyes and mouth are red. 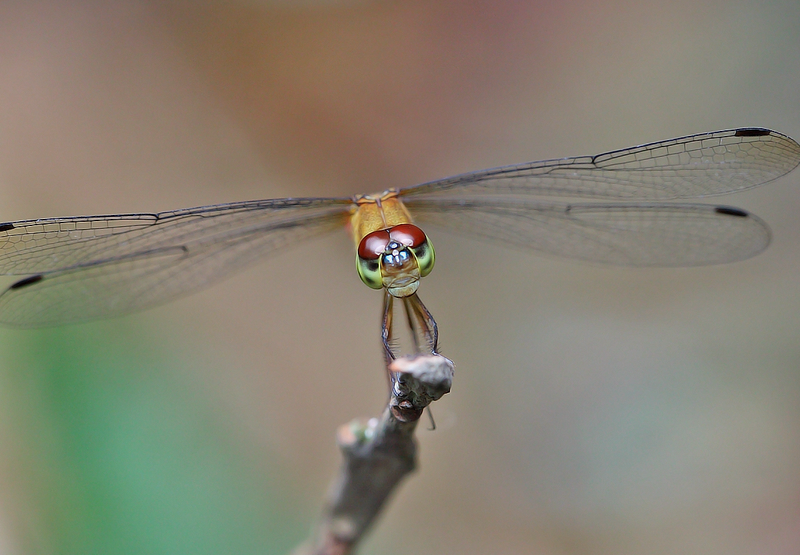 Females are less striking with dull olive green thorax. 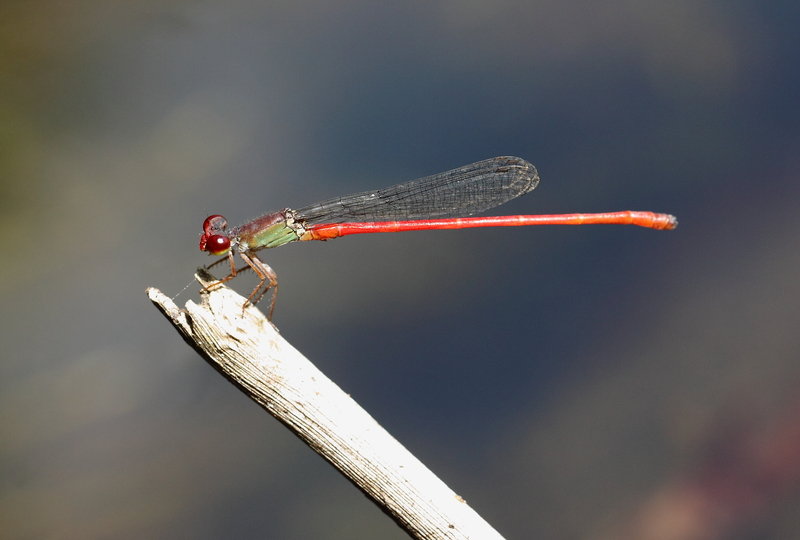 This brilliantly coloured damselfly is unmistakeable. 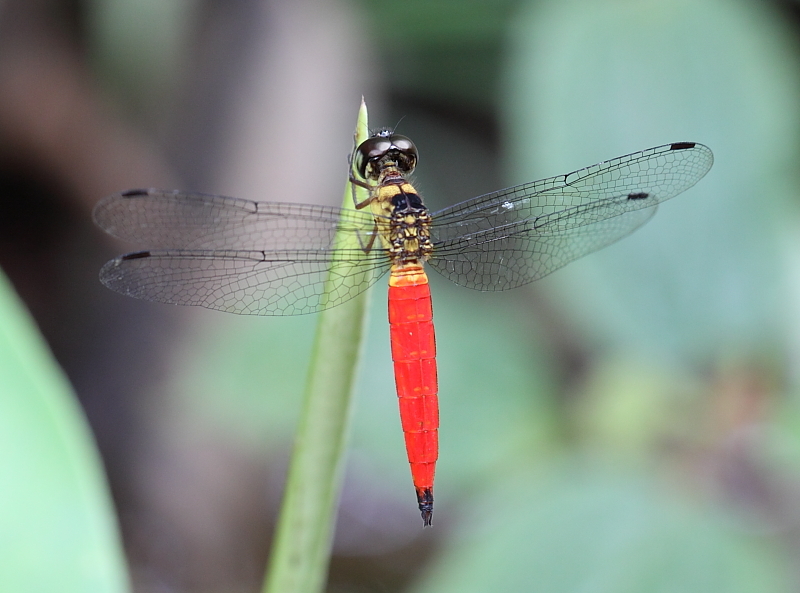 In the book “Dragonflies of Singapore”, it mentioned this is an uncommon species but I would think it is a relatively rare species, compared to Libellago lineata and Libellago hyalina. 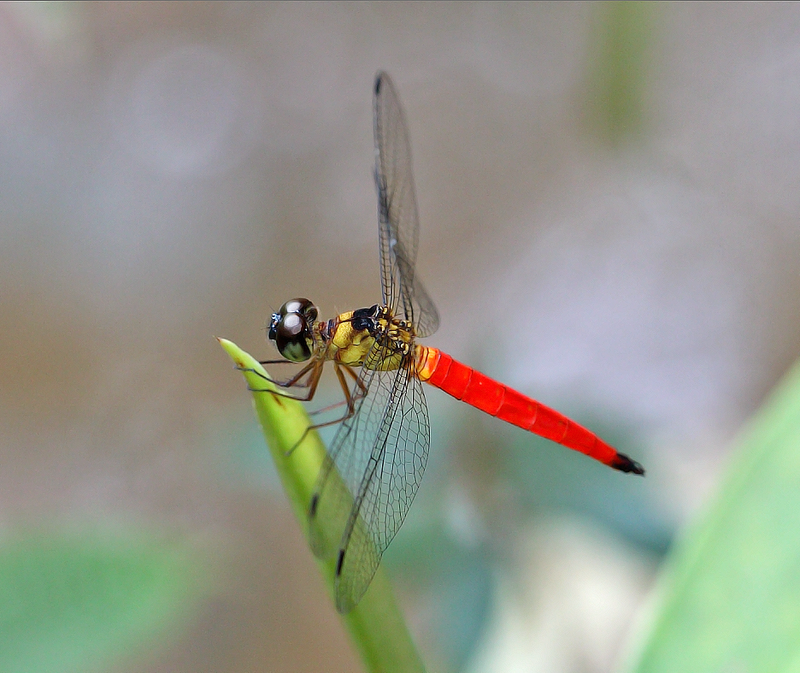 It can only be found at the Central Catchment Nature Reserve. 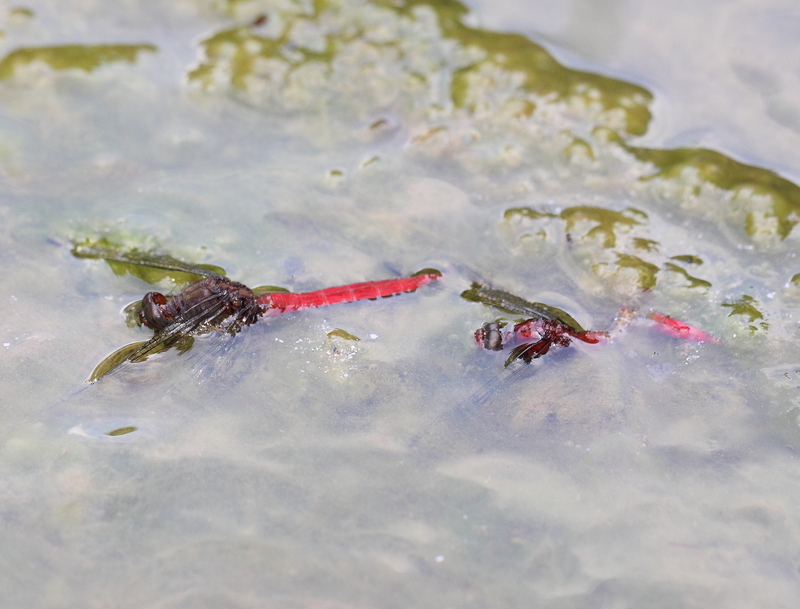 The habitat for this species is clear, flowing forest streams with sandy bottom. 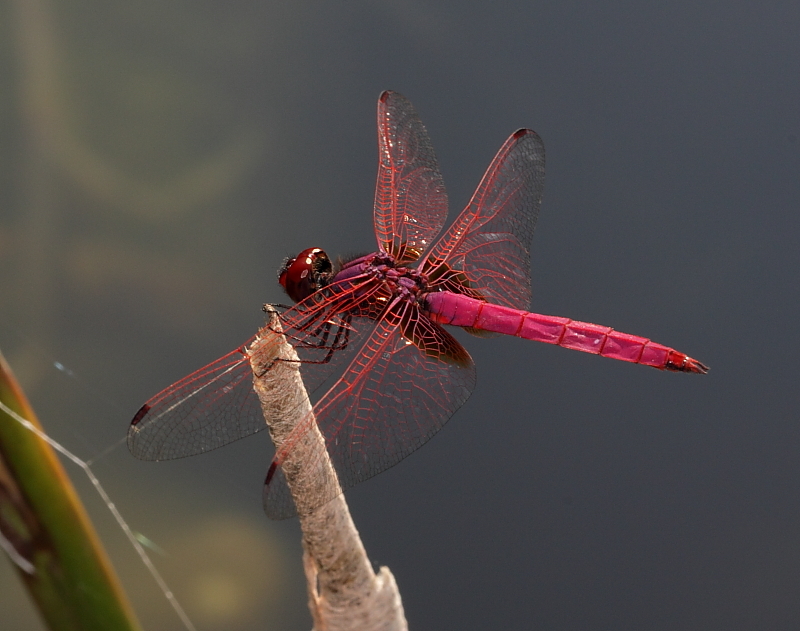 Male is often seen perching on twig, water plants or floating leaves flowing down the streams. So far, I have not seen female of this species yet. 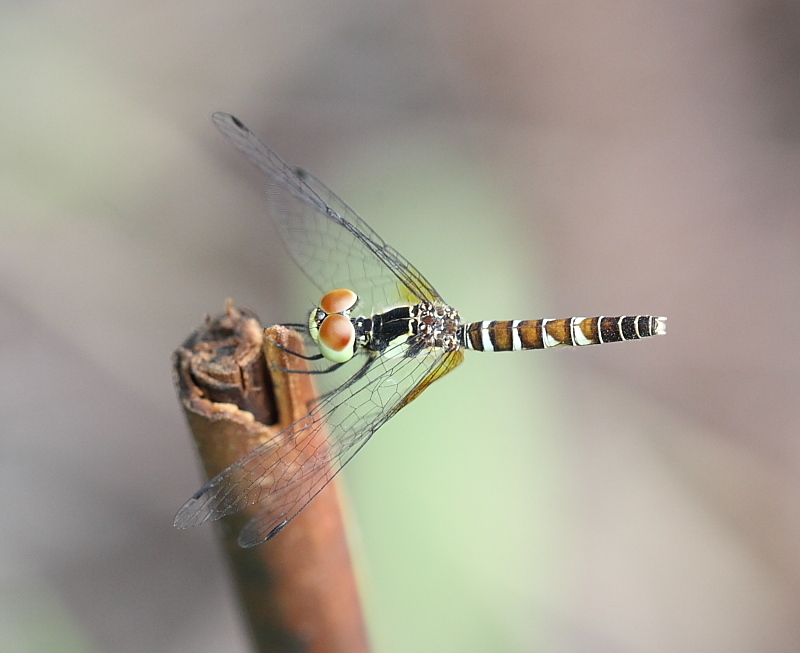 Female Lyriothemis cleis is variegated brown in colour and very rare. 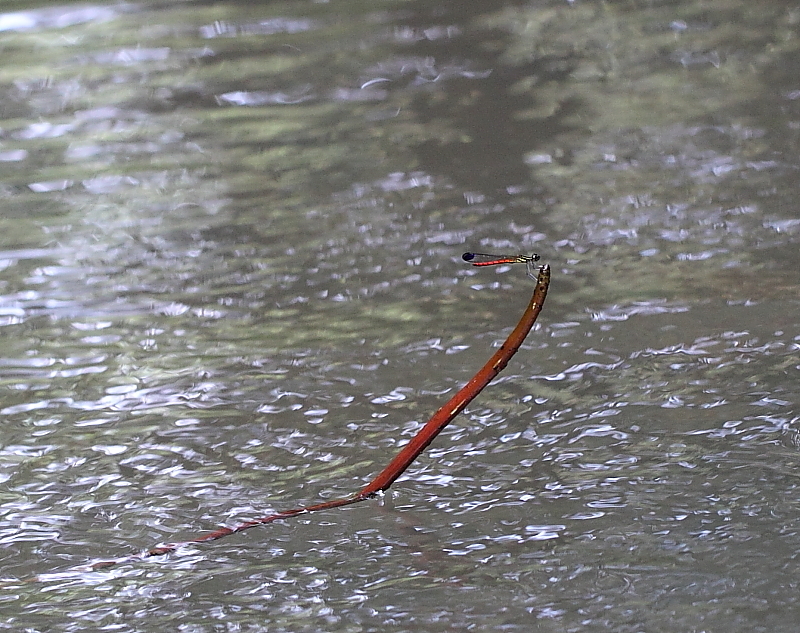 So far, I have only spotted once at MacRitchie Reservoir. 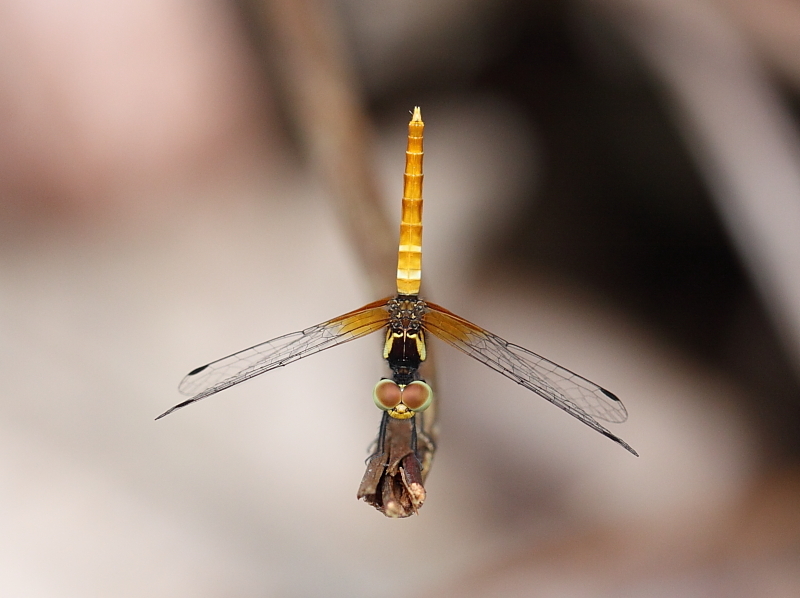 The abdomen is segmented with clear defined dark lines. 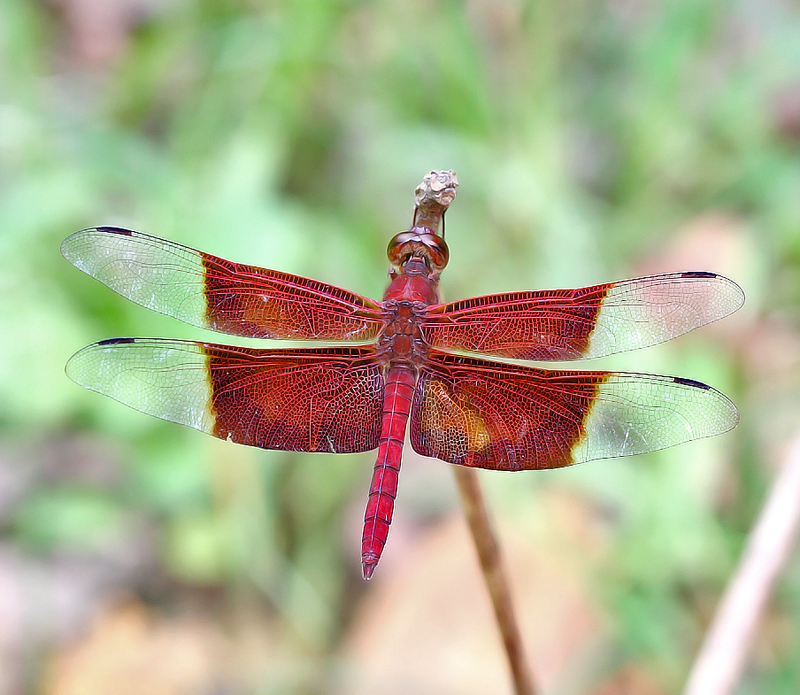 Lyriothemis cleis was first discovered by A.R. Wallace from Singapore in 1854. 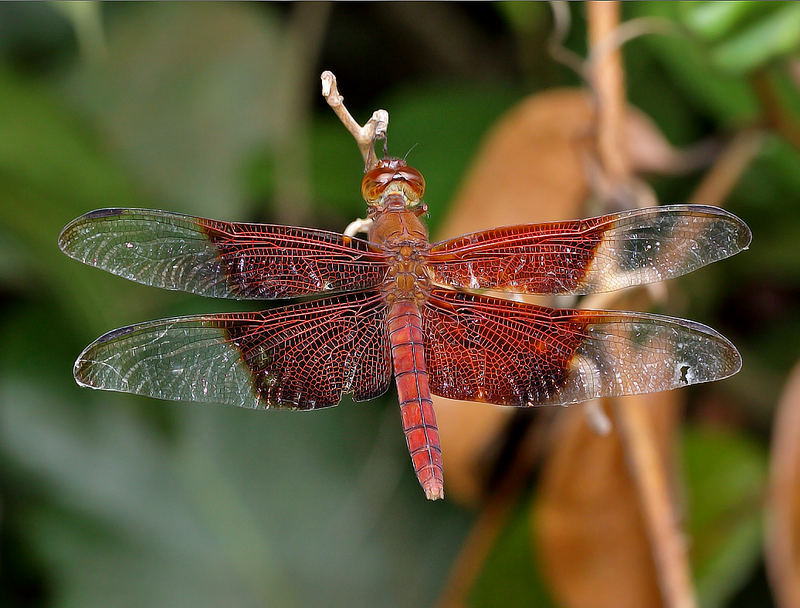 It is a rare dragonfly and found at Bukit Timah Nature Reserves and MacRitchie Reservoir. 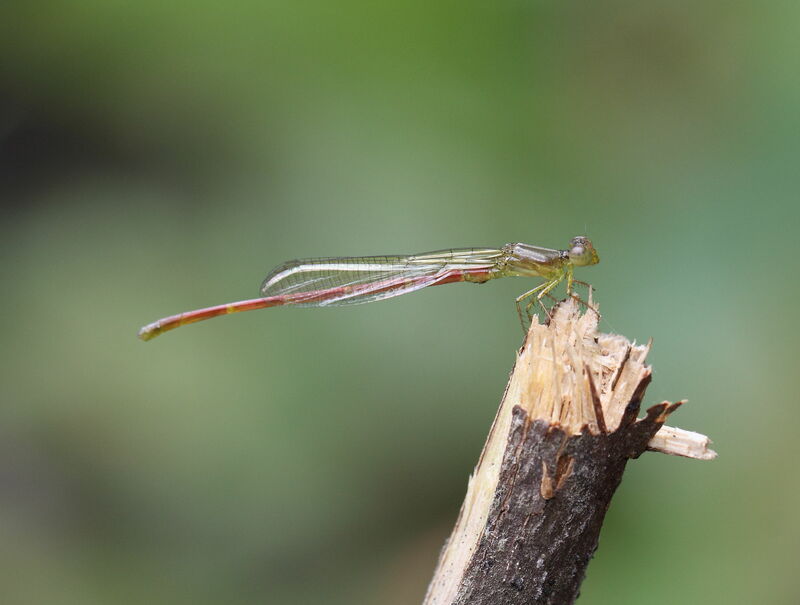 According to some texts, this species lives in pristine dipterocarp forests and the larvae lives in water-filled cavities in plants. 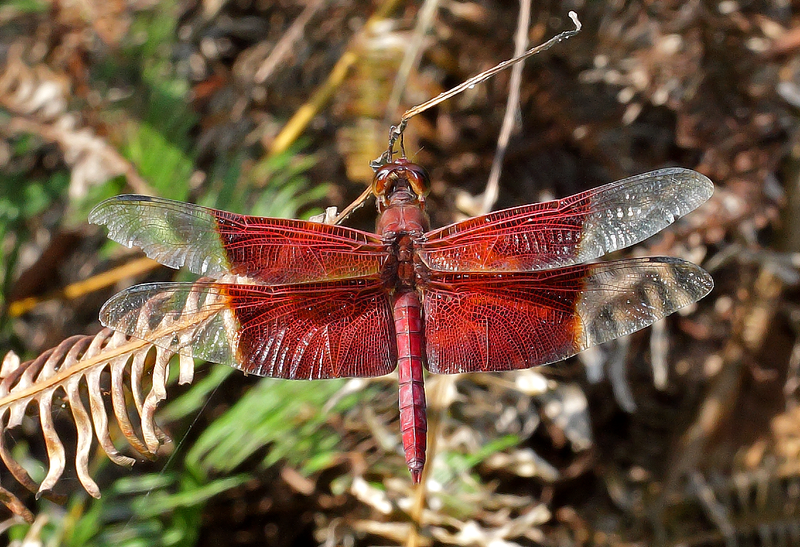 The abdomen is dull red in colour with well-defined segments. 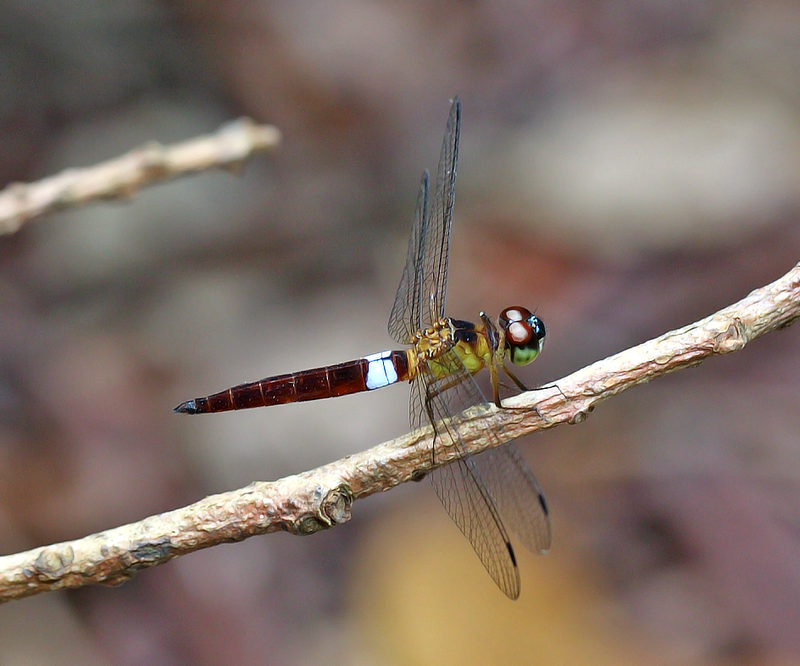 The eyes are metallic dark brown and clypeus is milky white. 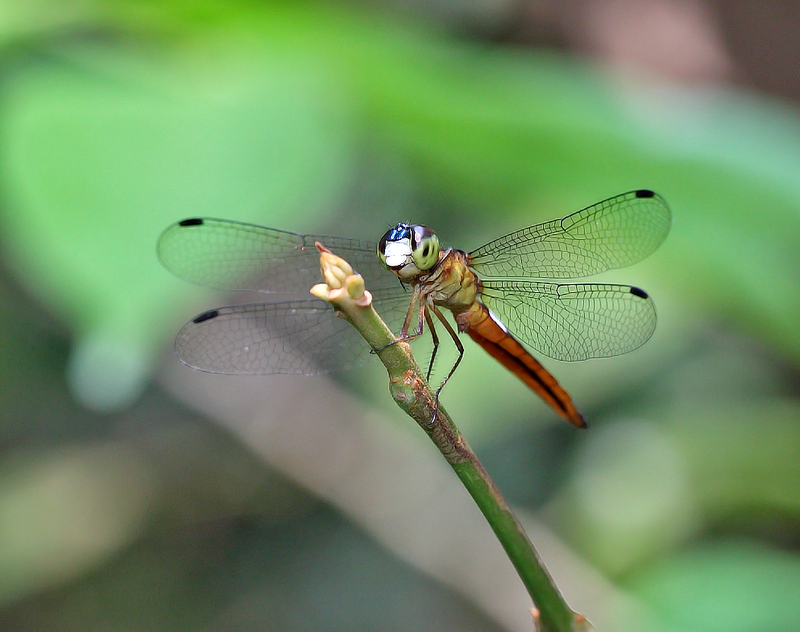 I have spotted this dragonfly a couple of times in year 2011 at the exact same spot along a forest trail at MacRitchie Reservoir. 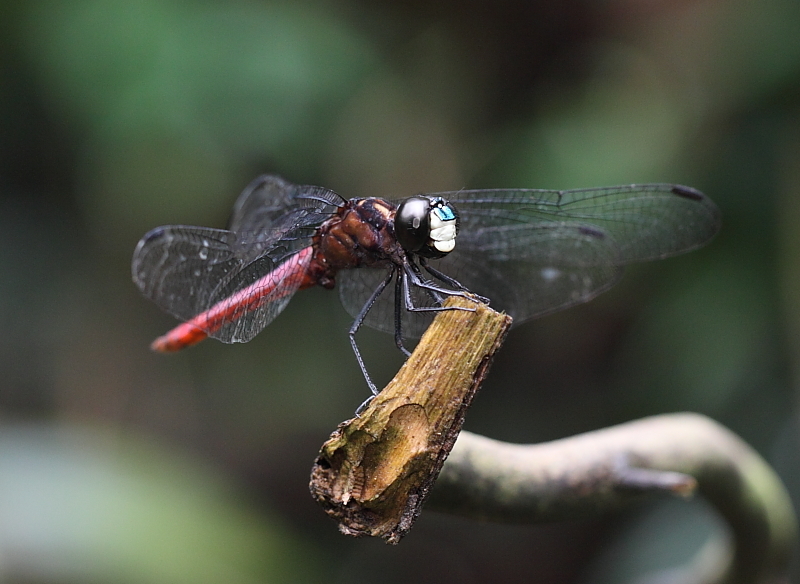 Male (notice metallic blue frons, milky white clypeus.and protruding secondary genitalia). 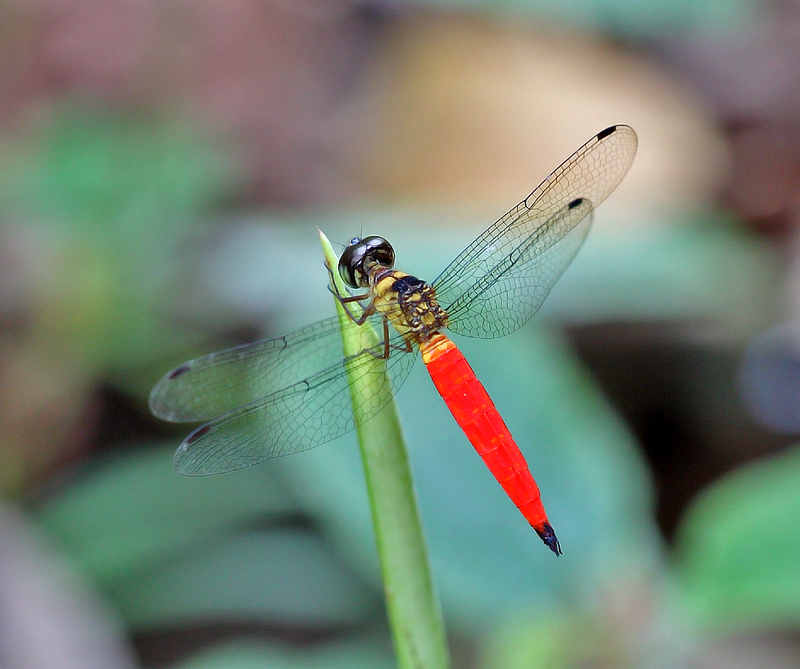 The smallest true dragonfly in Singapore and one of the smallest in the World, the scarlet pygmy has a total body length of merely 16-17mm. 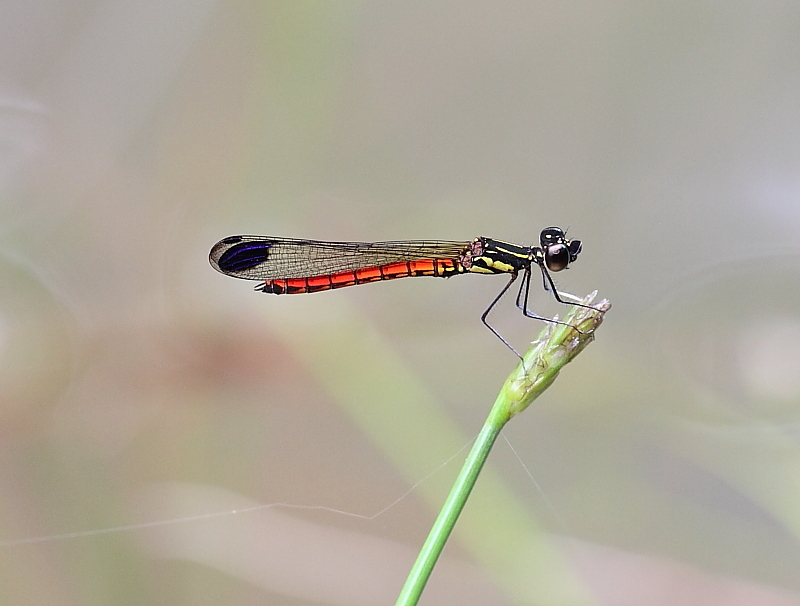 It is quite a localised species and commonly found at open grassy and swampy areas as well as inlets and water edges of reservoirs. 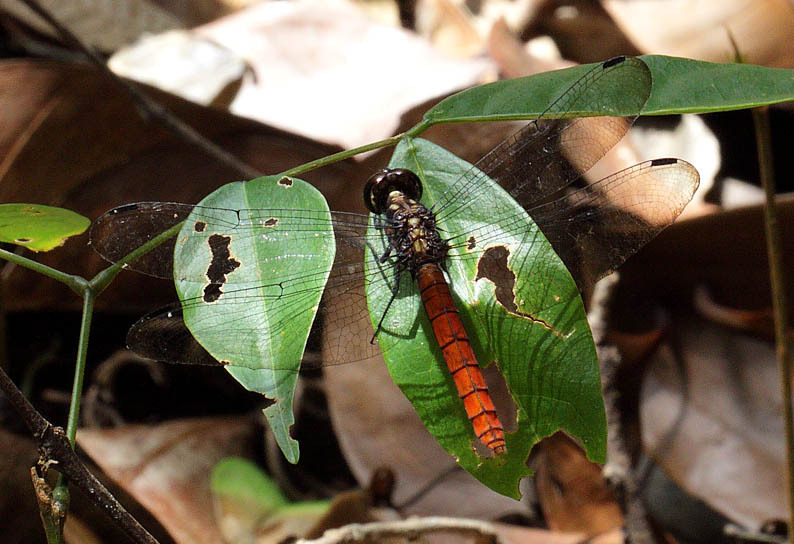 So far, I have encountered this species at Bukit Timah Nature Reserve, MacRitchie Reservoir Nature Reserve, and at the vicinity of Chestnut Ave forests. 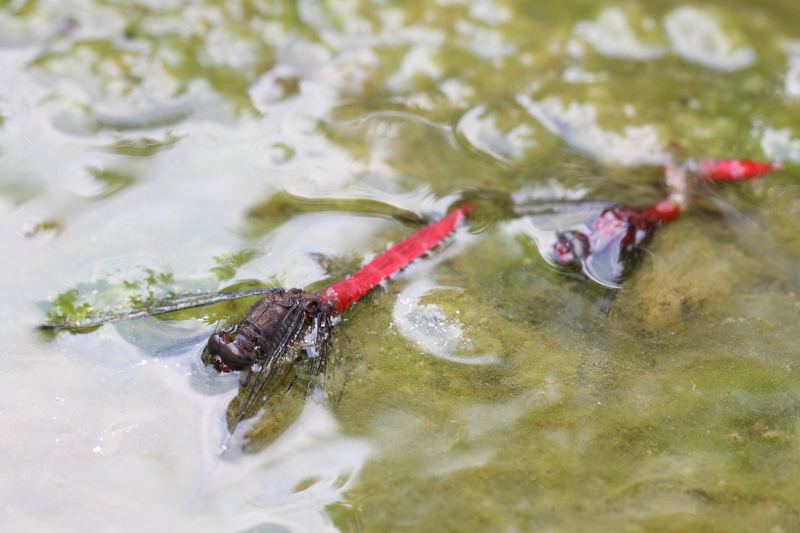 The male has a totally red thorax and abdomen. 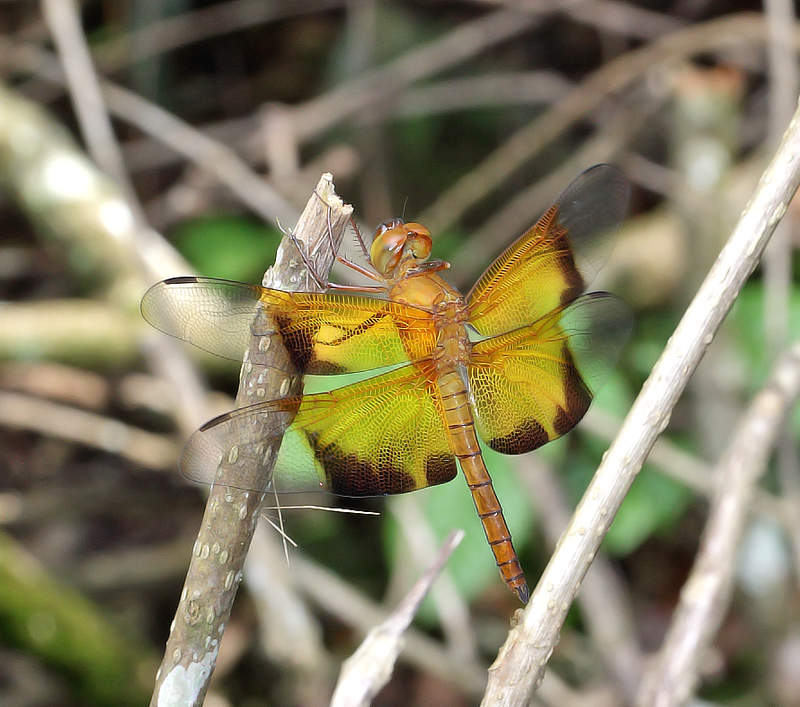 The wing base is tinted with amber. 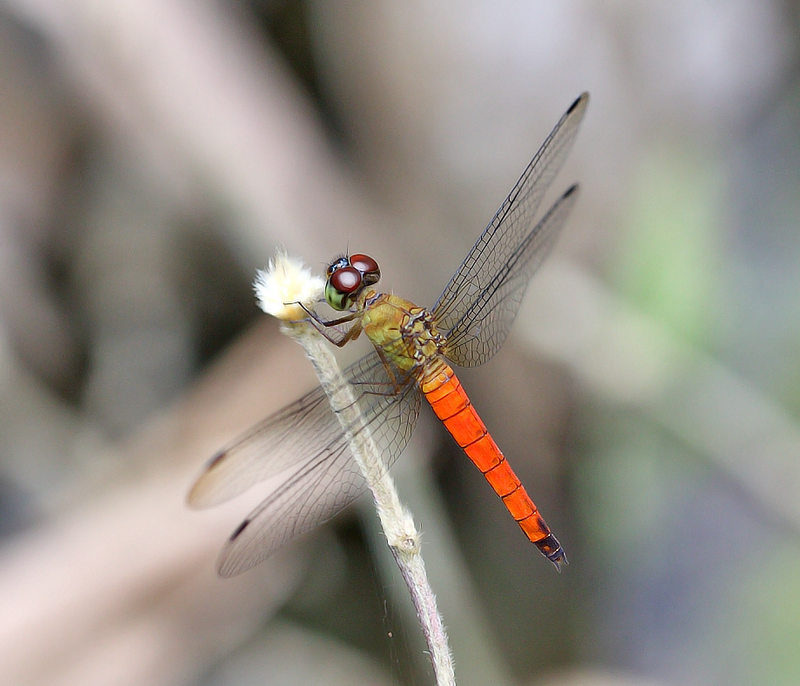 Juvenile male is yellowish brown in colour. 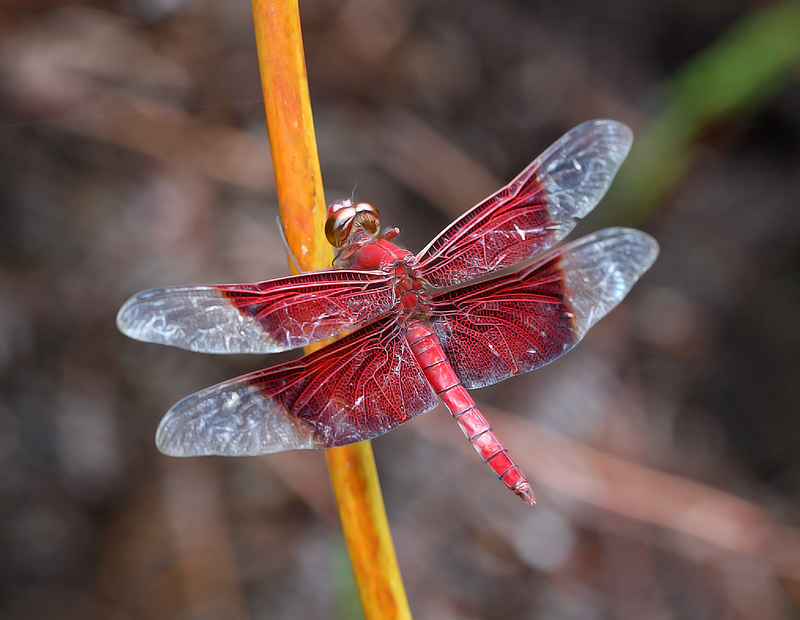 Female is darker and the abdomen has a transverse bands of dark brown and white. 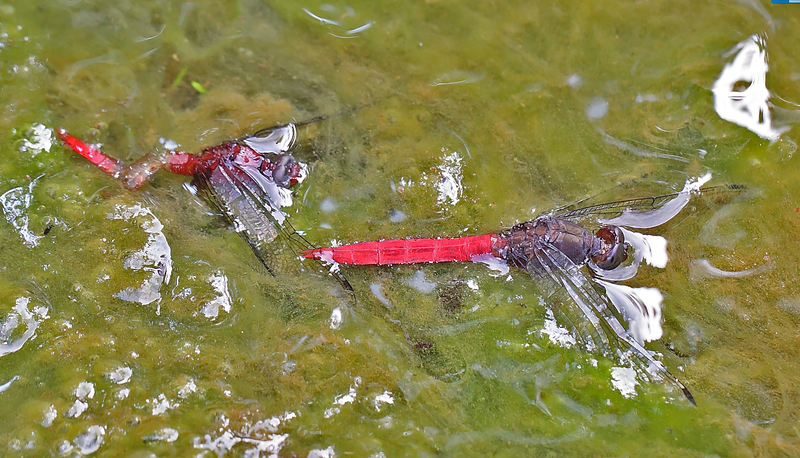 Both male and female are very active during noon time. It is a usual sight of seeing this species adopt an obelisk posture during mid-day whilst the sun is right above. I guess this is to minimise exposing their body to intense heat during the day. 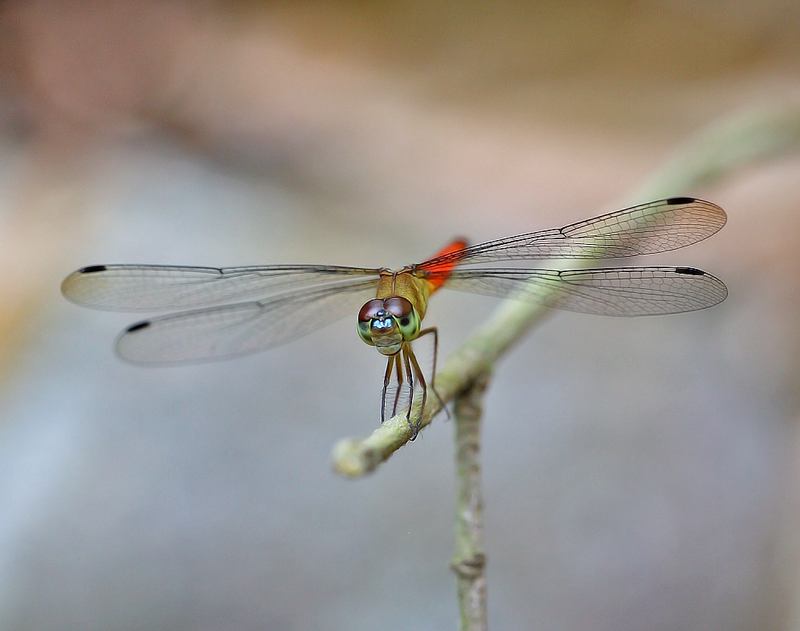 This is indeed a cute and lovely dragonfly species – one of my favourites. 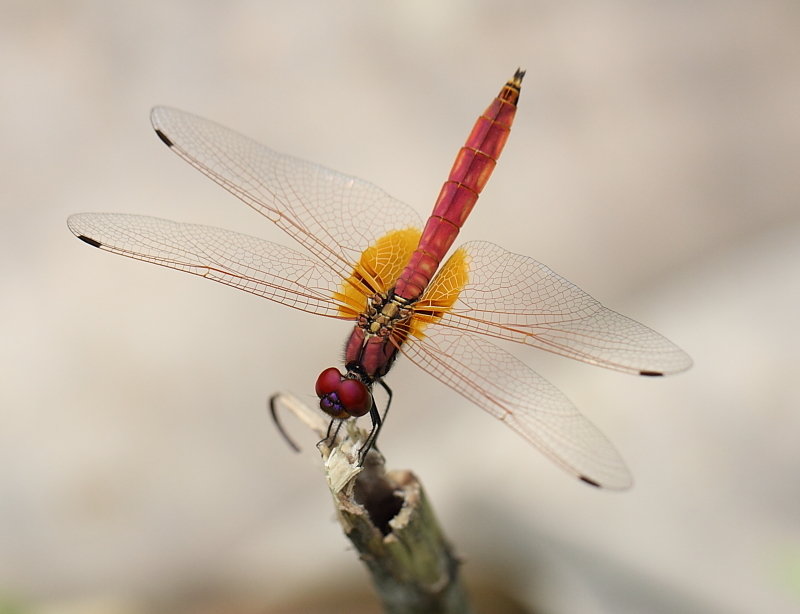 Trithemis aurora is a small but beautiful dragonfly commonly found in ponds, streams, edges of the reservoirs, and weedy drains. 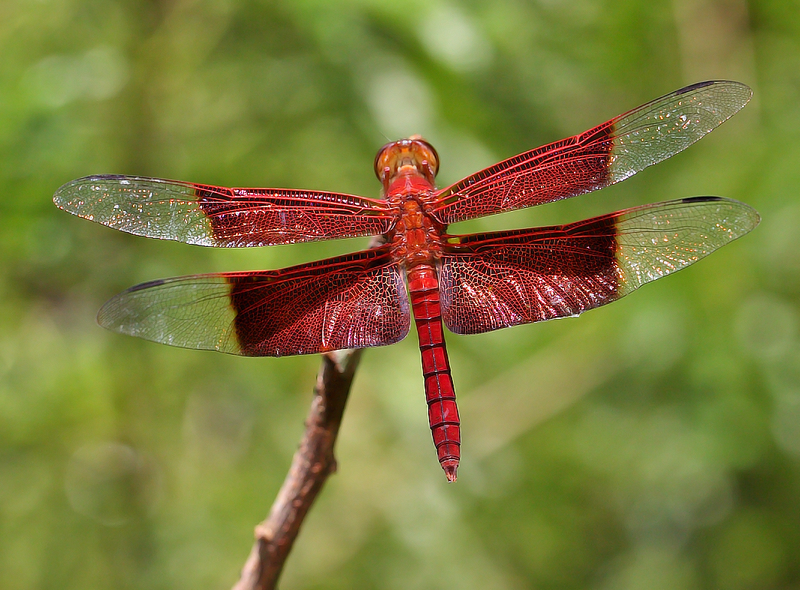 They can be found at Singapore Botanic Garden, Dairy Farm Nature Parks, MacRitchie Reservoir, and many other places in Singapore. 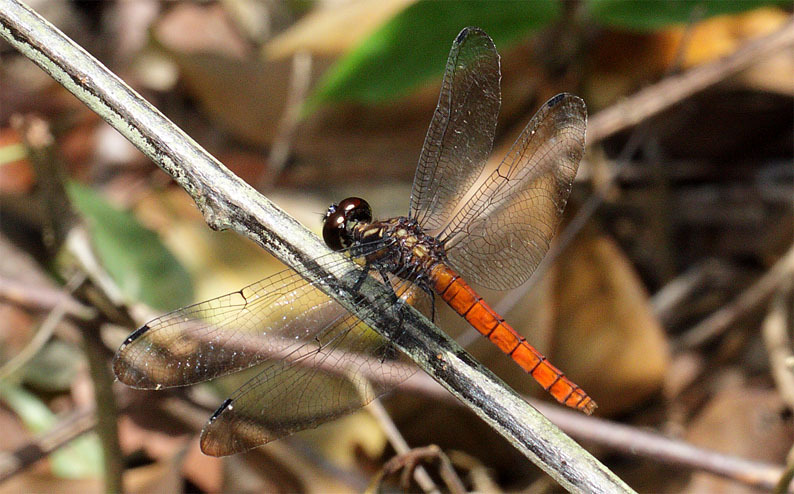 The eyes, thorax and abdomen are brilliant glowing red, wing veins are red, and base of hind wings are tinted dark red in male, dark brown in female. 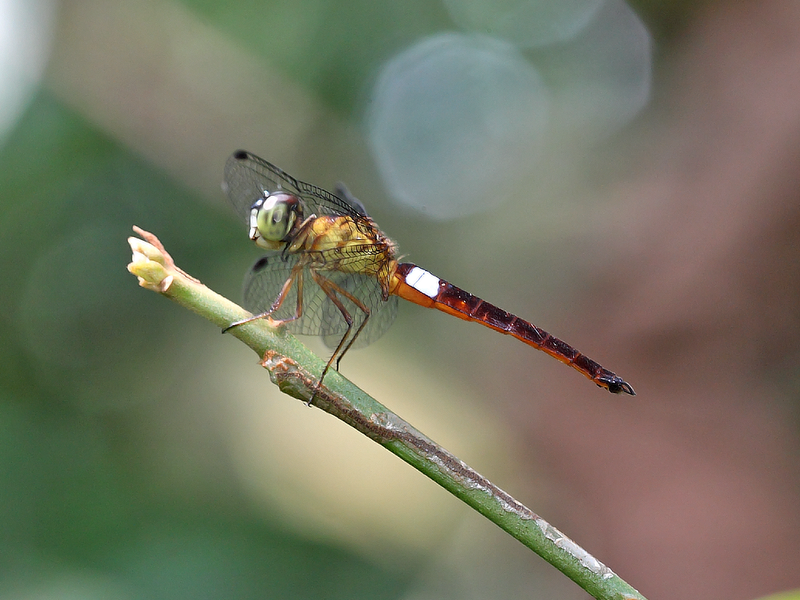 Immature male is brownish in color, similar to female, but without any black markings at the side of the abdomen. 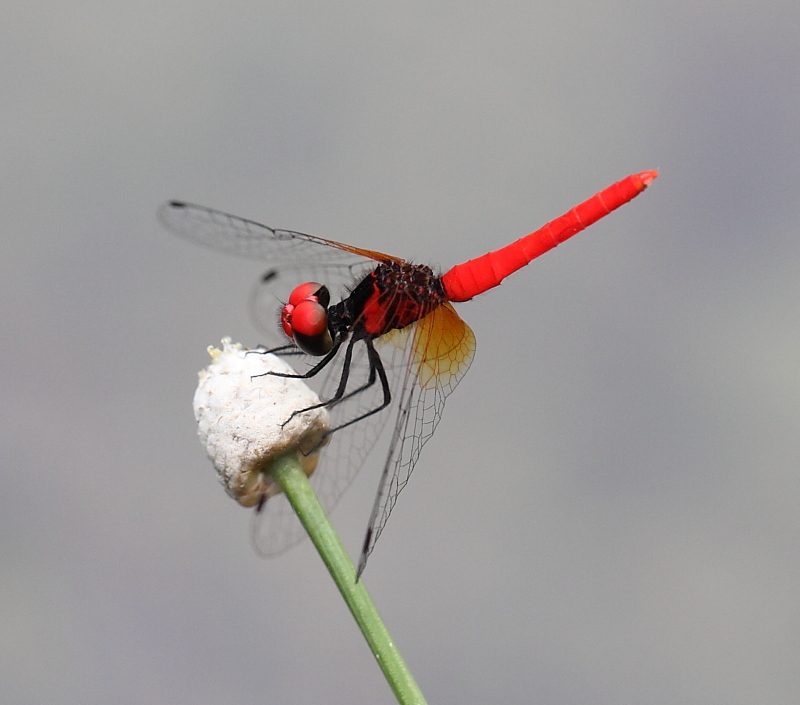 This is a sun loving species. 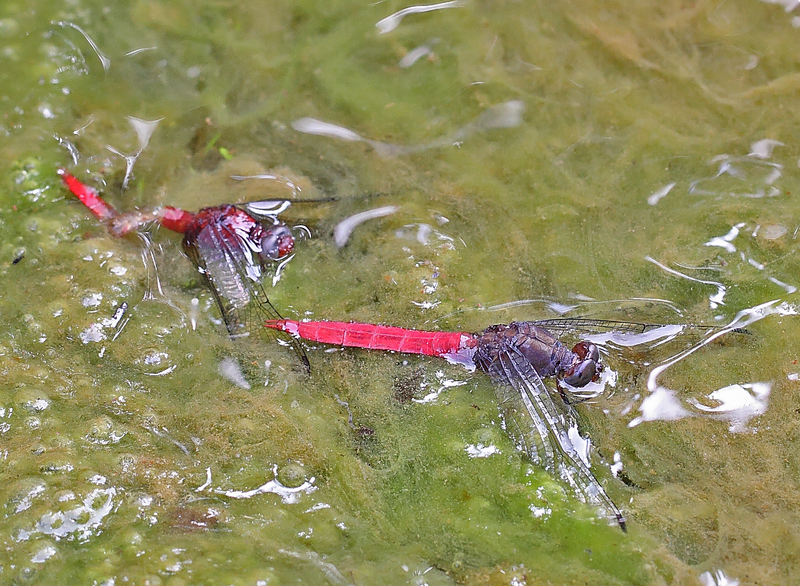 Male and female like to bask under hot sun in an obelisk position.